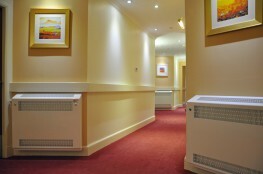 Contour Heating Products Ltd > News > What Size Radiator Cover Do I Need? What Size Radiator Cover Do I Need? The installation of a radiator cover is a huge benefit to any environment in terms of health and safety for anti-ligature or LST purposes. But how to do you know which size cover to order? The key to getting the right size radiator cover for you is to correctly measure the area. Contour prioritises ensuring that all of the environments that we work in are properly measured to ensure the best fitting radiator cover for the available space. We offer a bespoke range of options and are able to work around pre-existing radiators in environments in order to accurately fit the covers within the exact measurements needed. Contour are able to provide site surveys as part of our services to ensure that your radiator cover order to accurately measured and that any special requirements such as working around window sills are properly taken into consideration. Where Is The Cover Going? When installing radiator covers, and choosing which size you require, it is also important to think about the space available. If Contour installs a radiator cover into a hospital ward for multiple service user occupancy, space is likely to be large and very open. Keeping safety at the forefront of our minds; Contour will ensure the radiator cover is the correct size for this kind of environment. This kind of space will have different requirements for a small school classroom for example. Classrooms are full of tables, chairs, cupboards and, of course, pupils and teachers. This all takes up a certain amount of the available space. Contour will work to ensure that the radiator covers we provide for this space are properly sized designed to safely meet the needs of this space. No environment is the same as any other. Contour understands this. That is why we work on a bespoke, job by job basis when measuring the sizes of radiator covers; we build our products to meet the needs of the customer. We don’t work with a one size fits all mentality. Whether you need LST or Anti-Ligature covers, Contour can accommodate this. We are even able to offer a range of colours for your covers depending on your needs. Contour produces a range of innovative, safe surface temperature systems for healthcare, education, mental health, commercial and secure sectors. We work in close partnership with architects, M&E engineers, NHS Trusts, local authorities, design consultants and contractors to deliver outstanding safe heating solutions. Contour is a partner of BioCote® anti-microbial technology for LST and anti-ligature radiators. BioCote® additives reduce bacteria by up to 99.9% and are combined with Contour’s extensive range of colour-paints to coat products for a durable, high-quality finish.